A Pay What You Want PDF of An Ogre and His Cake is available here. The young heroes are invited to Massie Littlefoot’s birthday party before she departs for wizarding school in Waterdeep. 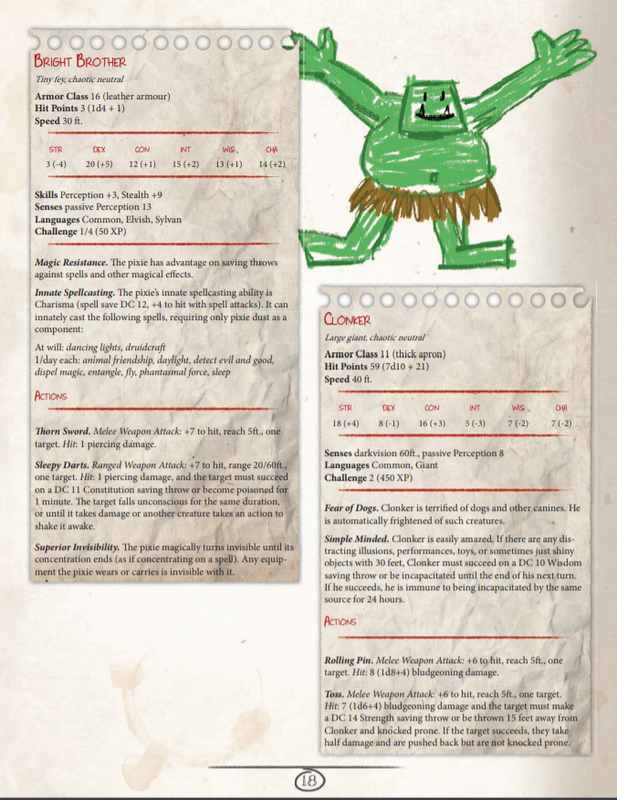 At the height of the party, Clonker, an ogre known to live nearby, steals Massie’s cake! The heroes must brave the forest and get Massie’s cake back before everyone goes home. This introductory adventure is designed for level 1-2 characters. 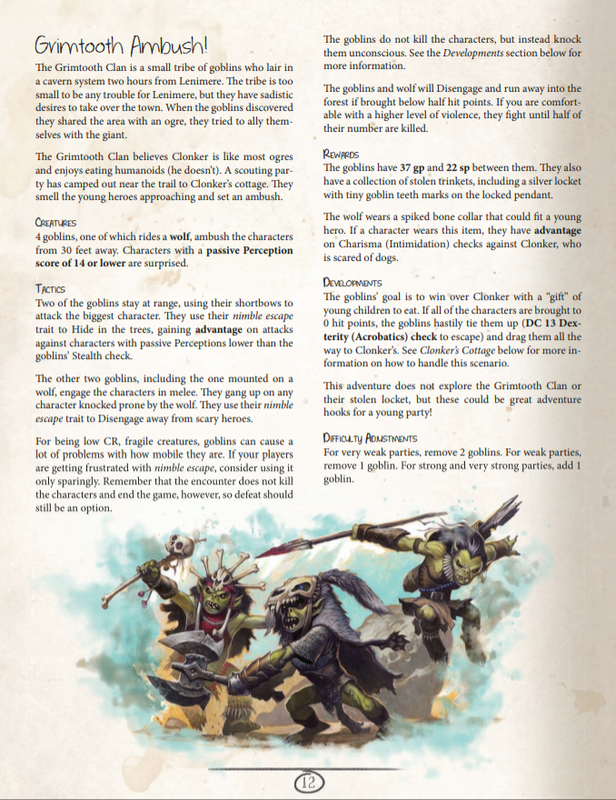 An Ogre and His Cake is an introductory 5th edition Dungeons & Dragons adventure built for and tested by kids. It is every parent or guardian's dream to share their passions with the young ones they love. We hope Clonker, the lovable ogre, opens these doors for you. We also want to support children and families who are unable embark on every adventure. All of our creator royalties (50% of what you pay, with the other 50% supporting the upkeep of the Dungeon Masters Guild and Wizards of the Coast) will be donated directly to Extra Life, a non-profit organization focused on supporting children's hospitals through communal gaming events. A beautifully designed single-session module with full-color artwork and cartography. A Printer Friendly version is also available. Tips on how to run Dungeons & Dragons for young players. Stat blocks for all NPCs and monsters. 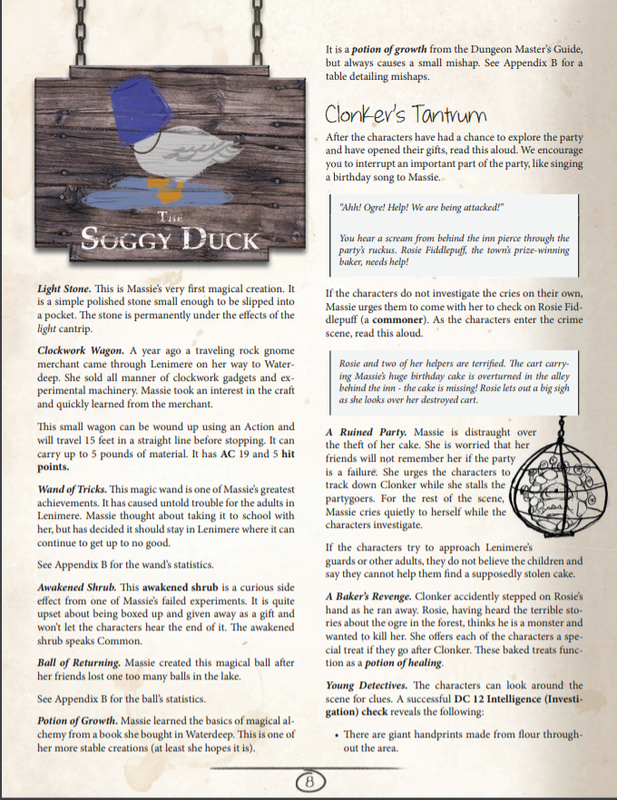 High quality DM and player maps for easy printing or virtual tabletop use. Specially crafted Kid Friendly Character Sheets, including a color-coded option. Four premade characters for easy game night preparation. Also check out the Guild's own Monsters Without Borders, a collection of community created monsters that fully supports Doctors Without Borders! About the Creators: Christopher Walz has been playing and running Dungeons & Dragons for over 14 years. His first memory of D&D is looking at the pictures in his brother’s Monstrous Manual before he could read. His favorite thing about tabletop roleplaying is watching his players take a world and make it their own, right before he mercilessly kills them with an intellect devourer. Emmet Byrne has been role-playing and Games Mastering for almost 20 years. He got his start reverse engineering the second edition AD&D rules from the Baldur's Gate PC RPG and hasn't looked back since. He's played every edition of D&D between then and now as well as a multitude of other weird and wonderful tabletop RPG systems, and was involved in the AGE system content for Kobold Press's Midgard Campaign Setting.